PubMatic is a publisher-focused sell-side platform for an open digital media future. Featuring leading omni-channel revenue automation technology for publishers and enterprise-grade programmatic tools for media buyers, PubMatic’s publisher-first approach enables advertisers to access premium inventory at scale. Processing over twelve trillion advertiser bids per month, PubMatic has created a global infrastructure to drive publisher monetization and control over their ad inventory. Since 2006, PubMatic’s focus on data and technology innovation has fueled the growth of the programmatic industry as a whole. 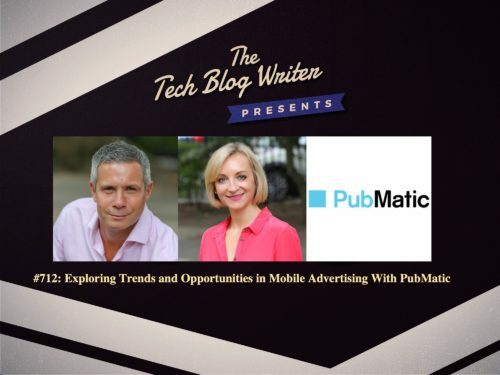 I invited Bill Swanson and Emma Newman onto the show to talk about how technology can help advertisers ensure their ads are only shown in high-quality online environments and trends and opportunities in mobile advertising. Bill Swanson, Chief Revenue Officer, EMEA, has been working in the media and digital space for nearly 20 years. He joined PubMatic in 2014, as director of publisher development, and was promoted to the position of country manager, UK. In this role, Bill was instrumental in shaping the UK into a model for other international country operations, signing notable publishers and developing a structure that allowed the business to scale. Now chief revenue officer of EMEA, Bill is responsible for growing PubMatic’s portfolio of premium publishers and media buyer partners across the region while ensuring the company is in the best position to capitalize on emerging technology opportunities. As VP UK, Emma Newman is tasked with growing PubMatic’s unique approach to the market, making sure that its customers (both supply and demand) are continually benefitting from its transparent and customer first approach. In addition, Newman helps PubMatic to develop new premium publisher relationships with a focus on growing and monetising mobile and video inventory as well as helping them navigate ad decisioning tools. Newman joined PubMatic in 2014 as senior director of international marketing, rising to the role of vice president of international marketing within a year. Prior to PubMatic, Newman held roles in marketing and business operations at iHeartMedia (Clear Channel UK), AOL, and Microsoft. Next Post711: The Music Technologist That Ozzy Osbourne Calls "The Rocket Man"